Researchers from the Centre for Ecological Research and Forestry Applications (CREAF) organised the workshop together with experts from Ecologic Institute in the context of the BeWater project. 20 people participated in the workshop, representing different sectors: agriculture, forest land owners, bottling industry, environmental protection NGOs, local entities, researchers, scientific communication. The workshop was attended by different representatives of the public administration: The Catalan Water Agency, Department of territory and sustainable development, the Catalan office for Climate Change, Agriculture Department and natural park administrations and municipalities. The participants expressed their very positive attitude with regards to the BeWater process in the Tordera basin and considered the river adaptation plan as a crucial instrument to promote the needed actions for building resilience in the basin. 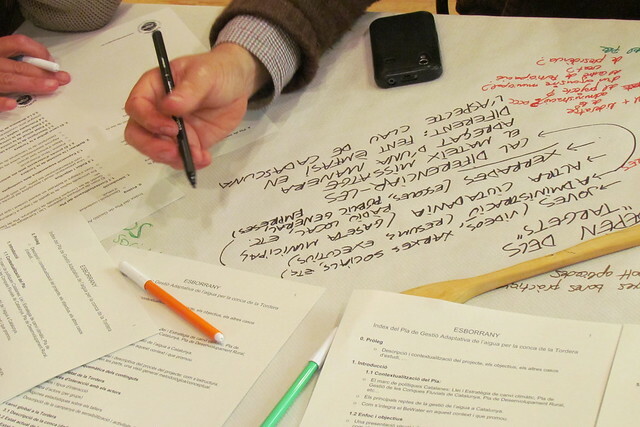 The workshop was part of a series of workshops aiming to develop a river basin adaptation plan for the Tordera river. In a first workshop the participants identified challenges related to water management and discussed options to deal with these challenges. In a second workshop and a consultation, no less than 33 options were previously refined and evaluated. Preferred options were establishing ecological flows and recovery of groundwater levels, access and availability of information, the involvement and commitment of citizens and agreements for adaptive forest management. “Last week’s workshop seamlessly built on the previous stages of the project and we now focused on identifying co-benefits between water management options and how the options could be implemented” said dr. Annelies Broekman, who is a researcher at CREAF. “Based on the valuable contribution by the participants, we plan to finalise the adaptation plan for Tordera by summer 2016” she added. Similar workshops are carried out in three other river basins in the Mediterranean area, located in Cyprus, Slovenia and Tunisia. The four river basins cover different environmental and socio-economic settings within the Mediterranean area.